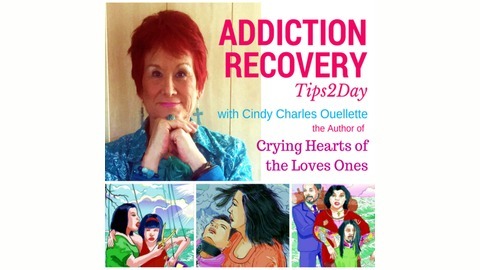 Welcome to Addiction Recovery Tip 2Day, with your hostess: Cindy Charles Ouellette. Cindy is the author of the book: Crying Hearts of the Loved Ones Thank you for enjoying today's tip for the day. We invite you to tune in tomorrow for another sobriety tip. And, please, visit our website cindycharlesouellette.com to send us your favorite recovery tip to broadcast. For now, remember, just for today, we don't pick up, or use, no matter what! Cindy is the Author of Crying Hearts of the Loved Ones eBook. 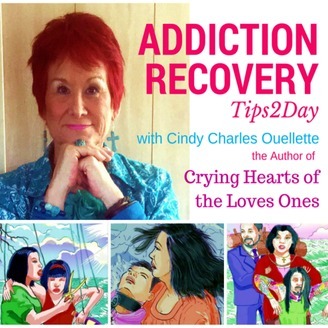 Cindy is: Addiction Recovery Coach | Motivational Writer | Motivational Speaker | Blogger about Recovery and Restoration | Podcaster about Addiction Recovery Tips. Today's tip is from Rivka Edery, the author of Trauma and Transformation: A 12 Step Guide. Let's hear what Rivka Edery has to share. Dear Listeners, I am delighted to share a recovery tip for this wonderful podcast. Let us take a look at the first and most important step in trauma and addiction recovery. Can you look at your beautiful self in the mirror and say your name? Pay attention to how you feel: comfortable or uncomfortable? Can you stand in front of a mirror and say: "I am .............", and repeat this 3 times? If you feel uncomfortable, can you identify which part of you that you find most difficult to accept, and why? Love and healing! For more recovery exercises and steps to overcome trauma, check out my book: Trauma and Transformation: A 12 Step Guide. My deepest thanks to Cindy for this incredible podcast and all that she does. And of course, let us hold up a candle for all of you beautiful survivors who refuse to let others, including your addiction. determine the rest of your life.